PezCycling News - What's Cool In Road Cycling : EUROTRASH Purito Monday! Joaquim Rodriguez has moved to 1 second behind Fabio Aru in the Vuelta a España and all is set for the decisive time trial and summit finishes in the final week. We have all the reports, results and video from Spain and also Brussels, Britain and Fourmies. Plus contract news, Saitama Criterium, no Worlds for Fabian Cancellara, US Worlds team and that Peter Sagan crash. EuroTrash coffee time. TOP STORY: Vuelta too hard? It wasn't that long ago that the Vuelta a España made the revolutionary move of shortened its stages making the race the most exciting Grand Tour of the season. The race also introduced many new summit finishes which pulled in both the fans on the roadside and TV viewers. This year most stages are still short and sweet with a battle at the end, but have they gone too far with too many summit finishes. Instead of the long dull stages, similar to the Tour de France, were a group is allowed to go up the road early and after building up a big lead is pulled back for a bunch sprint, we now have a group going early to be pulled back on a summit finish. At least it doesn't take all day. The problem is that the race has changed from one formula to another, in saying that, it is a formula that is good for TV and the fans at the finish, but not for all riders. To (have any hope to) win the Vuelta you have to have an explosive uphill finish, the exception being Tom Dumoulin. The race has frightened off the top sprinters, no Cavendish, Kittel, Greipel etc. but it does give the second string fast-men and the young guys a chance. So is the Vuelta too hard? Danny Van Poppel did not miss his chance to take the sprint at the end of Stage 12 in Lleida and hand his Trek Factory team their second victory in this edition of la Vuelta. The 22-year-old Dutchman, whose father Jean-Paul had already won nine Vuelta stages in the 1990s, overcame a puncture 10km from the line to reward his team-mates for their efforts all day and emulate Jasper Stuysen, winner of stage 8 in Murcia. Chris Froome (Sky), who suffered a foot fracture in a crash on stage 11, did not start. After 7km going slightly downhill, five riders broke clear: Maxime Bouet (Etixx - Quick-Step), Miguel Ángel Rubiano (Colombia), Jaco Venter (MTN-Qhubeka), Bert Jan Lindeman (LottoNL-Jumbo) and Alexis Gougeard (AG2R-La Mondiale). Their lead increased rapidly to reach 5:40 after 60km over a cautious peloton. Bouet was first over the top of the only ascent of the day, the 2nd category Coll de Boixols. After the climb, Giant-Alpecin came to the front of the bunch to lead the chase. Helped by Trek, they brought the gap down to around three minutes with 50km to go. But the five continued to work perfectly together and still held a 2:20 lead 20 km further down the road. Rubiano was fastest at the intermediate sprint of the day in Gerb (149km). In the last 20 km, with the gap still at two minutes, Lampre-Merida riders joined the chase, working for Max Richeze. The lead of the escape was still nearly one minute at the 10km mark when Danny Van Poppel was forced to change a wheel after a puncture. In the finalé, Bouet and Venter both tried to attack to hold the peloton at bay but they were pulled back in the last kilometer as the sprint was underway. South-African Daryl Impey (Orica-GreenEDGE) was the first out but he couldn't resist the speed of Van Poppel, who took Degenkolb's wheel and jumped past everyone. Tosh Van der Sande (Lotto Soudal) was third ahead of Nikolas Maes (Etixx - Quick-Step) and Degenkolb. Fabio Aru retained his leader's red jersey. 3rd on the stage, Tosh Van der Sande (Lotto Soudal): "It was hard. In the finale, in the last 500 meters I think, I was in the lead. It was too early but I had good legs. But they came back from behind. I didn't have any speed left. But it's OK, it's been five Top 10 places now. I didn't expect that before the Vuelta." 6th on the stage, Jempy Drucker (BMC): "Of course I would have loved to celebrate my birthday. But it didn't work out. That's the race. The sprint was a little bit tricky. It started slowing down again. I was well positioned but suddenly a wave came back on me like three days ago. It's a pity. The team worked well, that's fine. When you don't win, there's always a possibility to do better. You have to live with it. I hope I can go all the way to Madrid to d the sprint there." Overall leader, Fabio Aru (Astana): “Tom Dumoulin is not the only rival. We have Purito, the pair of Movistar with Alejandro and Quintana. Now we have to stay focused and not underestimate anyone. There is never an easy day in la Vuelta. In all stage races every day is important. Today was not totally flat. Although we had a sprint, it was quite stressful. Another step and we are already thinking of tomorrow. I slept well, I rested. I just think about the end of la Vuelta. Froome is going to be missed on this Vuelta. He rode a very hard stage with a broken foot. I wish him a prompt recovery." Green jersey, Esteban Chaves (Orica-GreenEDGE): "The mountain has only started. There are three or four more stages that are as difficult as yesterday's. We continue with the same goal as when we started the Vuelta. Trying to make it into the Top 10 in the GC and see if my body is competitive for 21 days. That's my main goal in this Vuelta." 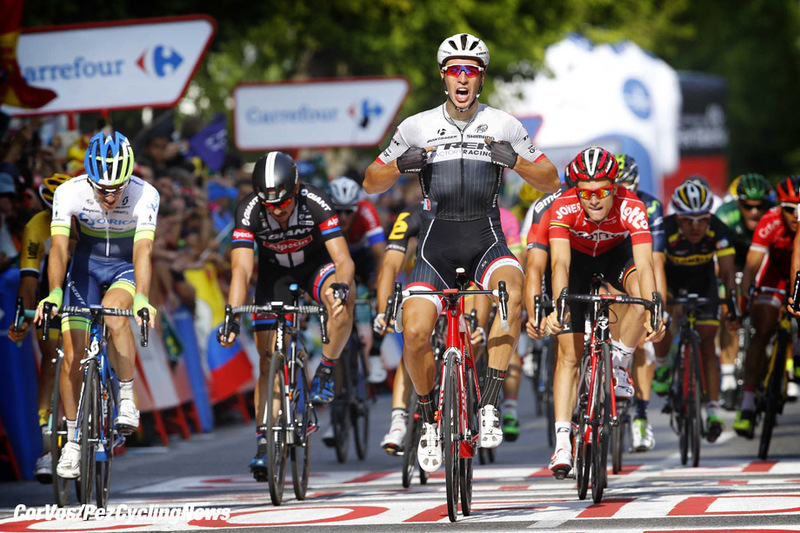 White jersey, Tom Dumoulin (Giant-Alpecin): "It was not perfect. We didn't get it right. A sprint is about positioning and you can be the fastest sprinter and still not win. I had a good ride yesterday but I didn't quite surprise myself like in the stage I won. This is completely new to me. I hope to keep my place in the GC. That would be very nice. But there's so much more time I can lose. If I don't have a very bad day I might try to get it back in the TT." Break rider, Maxime Bouet (Etixx - Quick-Step): "It was 200 meters too short, 200 meters too many in the life of a cyclist, 200 meters over 178 km is nothing. Had the finale been flat, I think I would have gone all the way. But it was slightly uphill like on Paris-Tours, even a bit harder. We would have needed five or then more seconds under the red flame. The shape is here. When you're 23rd overall, you can be relaxed about your condition. Yesterday I was not bad, today I wanted to be in the front. With Etixx we try to have a rider in the break everyday. Tomorrow I'm going to rest a bit. A raid like today with a lot of headwind, it wears you out. I'm also going to help Gianluca Brambilla, who is 13th overall. I also hope to ride a good TT." Break rider, Alexis Gougeard (AG2R-La Mondiale): “I thought we could make it. My team director was telling me the gaps on the radio and I could see we were resisting well. I attacked with 3.5 km to go because we were not working so well together anymore. After that, for me it was over. It's a missed opportunity. It's a pity. I will certainly want to break again in the next days but I must also spare myself a little because I'm really intent on finishing this Vuelta." Jaco Venter (MTN-Qhubeka): "We wanted to get someone in the break today. After the last few stages we didn’t want to work so much in the peloton looking at a possible sprint, so this seemed to be the best choice. I managed to get into the day’s break but we were never really able to build up a big lead. We tried to push it on the downhills and worked really well together. With 10 kilometers to go I started to think that we would have a chance to stay away, so I tried to save some energy. When the others started looking at each other 1.5 kilometers before the finish I attacked. I gave it everything I had, but when I looked around at the 500 meters mark the peloton was there. I’m disappointed, since it was so close. It was a hard day." 10. Leonardo Duque (Col) Colombia. 10. Louis Meintjes (RSA) MTN-Qhubeka at 4:15. Stage 13 was designed for a break and Nelson Oliveira saw his boldness rewarded when he outwitted his breakaway companions to win on his own in Tarazona, handing Lampre-Merida their first stage win in this edition of the Vuelta. The 26-year-old Portuguese rider attacked on the descent of the last of three climbs of the day, 27 km from the finish, to clinch his first major victory, with a minute lead over Julien Simon (Cofidis) and Nicolas Roche (Sky). 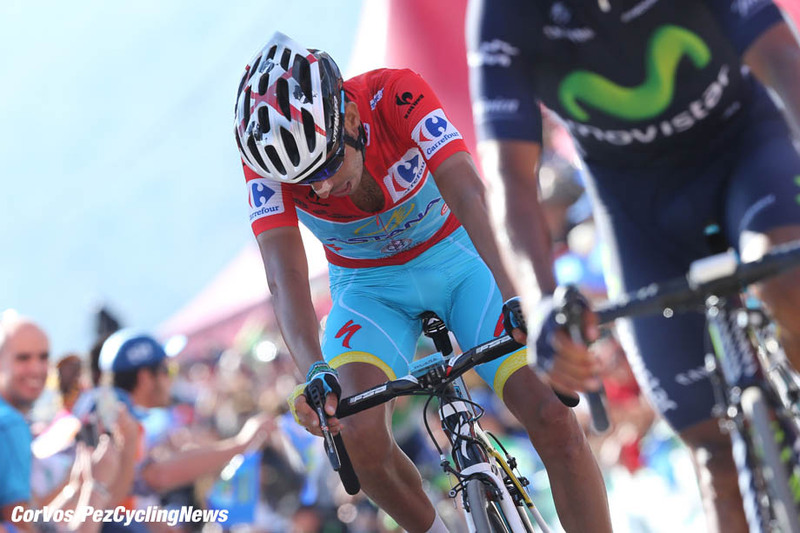 Italy's Fabio Aru (Astana) retained his overall leader's red jersey. Several attacks took place in the first hour of the race, often involving Sylvain Chavanel (IAM Cycling). The Frenchman was instrumental in starting the break of the day on the Cat 3 Collado de Oseja, when he went with Oliveira and Yukiya Arashiro (Europcar), soon to be joined by Alessandro De Marchi (BMC), Mikael Cherel (AG2R-La Mondiale), Jerome Coppel (IAM Cycling), Ruben Plaza (Lampre-Merida) and Cameron Meyer (Orica-GreenEDGE). At the back, Nairo Quintana (Movistar), who had been sick for a few days, struggled to stay with the pack. On the big climb of the day, Alto de Beraton (Cat 1), the eight front riders were joined by 16 others: Sergio Henao (Sky), Nicolas Roche (Sky), Rinaldo Nocentini (AG2R-La Mondiale), David Arroyo (Caja Rural-Seguros RGA), Yohan Bagot & Julien Simon (Cofidis), Niki Terpstra 6 Gianluca Brambilla (Etixx - Quick-Step), Kenny Eissonde & Kévin Reza (FDJ.fr), Valerio Conti (Lampre-Merida), Maxime Monfort (Lotto Soudal), Jose Joaquin Rojas (Movistar), Stephen Cummings (MTN-Qhubeka), Romain Sicard (Europcar) and Pawel Poljanski (Tinkoff-Saxo). Ruben Plaza was first at the top of the first two climbs of the day. With 100km to go, the lead of the 24 escapees settled at 2:30 over a pack led by Fabio Aru's Astana teammates. Twenty kilometers further, the gap rose to four minutes. On the third and last ascent, Alto de Moncayo (Cat 3), as the gap came down to 3:30, Oliveira and Chavanel tried to part company with the front group. Then Poljanski went on his own and reached the top ahead of a scattered breakaway group. Nelson Oliveira attacked again on the descent as the gap went over five minutes. A time trial specialist, the Portuguese increased his lead continuously to cross the line on his own with a minute's lead over his former companions, led by Julien Simon and Nicolas Roche. The peloton crossed the line 4:48 later, allowing Brambilla and Sicard to climb up the GC to 9th and 10th respectively, 2:51 behind Aru. Stage winner, Nelson Oliveira (Lampre-Merida): "It was a stage I had written down on the road book. I tried from the start but then with such a big group, we didn't work so well together. I tried to go early even if it was a bit crazy but I had good legs and I was hoping that with such a big group, it would be difficult for them to get organized to chase behind me. They were the longest 30 km in my whole life. I'm very happy about what I did. But I must thank my team-mates and especially Ruben Plaza and Valerio Conti who were in the break and worked very hard to quash the attacks behind me. They did a hell of a job. I thank the whole staff of Lampre. To win my first international victory in such a grand Tour as the Vuelta, it's definitely one of the happiest days in my life. The plan was to go in the break as we were almost certain that it would go all the way. It worked for me and for the whole team. Seeing that the group was not working too well together we decided to attack in the last climb. Then I decided to go on my own and since I'm a time trial specialist, it was a time trial all the way to the finish line. There aren't many chances left in this Vuelta and we have three very hard days ahead of us. But we're going to continue to try and if we can, go in the breaks. I'm a little bit too far but it could be possible for Ruben. We have to see how the race goes, if there's a break or something. I'm pretty good in time trials and it was a plus, especially with the headwind. With my power and my strength I managed to be consistent in the last 30 km. It was an advantage against the others. And my team-mates did the rest." 2nd on the stage, Julien Simon (Cofidis): "It battled for a long while. We were well placed with Yohan, we gave everything. I had pinned down this stage and I delivered. Going into the break was the hardest part. There was only the finale to look forward to. At the start, we didn't work too well together but in the end it work out fine. Everybody knew that there was a stage win at the end. But Oliveira was amazing. I have some regrets because I won the sprint for second place as I had missed out on all my sprints so far. It came close. But he jumped at the right moment and he made a gap in the descent. It was a great performance, you can't take that away from him. Now we have three days in the mountains. I'm going to go into the autobus and go for a stage win next week." 3rd on the stage, Nicolas Roche (Sky): "It was still a very tough day. I started on the wrong foot and it took a while to get back in the group and as the race went on it was important to go and give a hand and follow the riders in the group. The team was really looking forward and pushing to be in the break. We were three in it at one stage. I tried to put a bit of pressure in the climbs to give it a go and in the end Sergio led me out to try and go for a sprint." Overall leader, Fabio Aru (Astana): "It went very fast today, we didn't have any time to breathe ahead of the three grueling days ahead of us because there was a large break with many good riders. 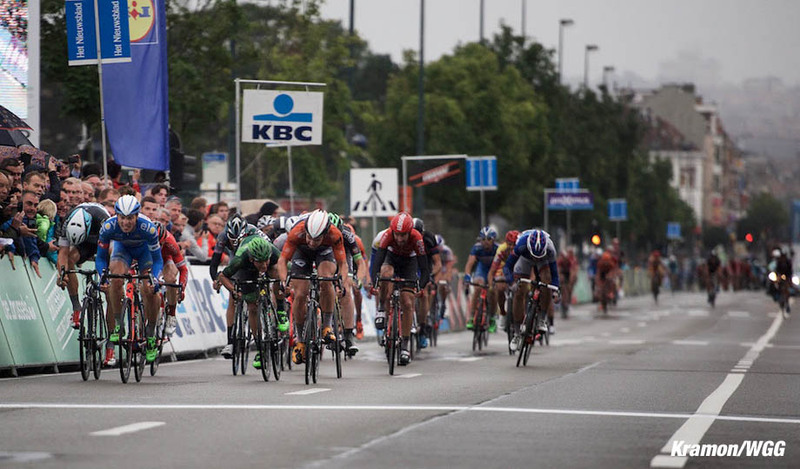 With riders like Sicard and Brambilla who were not too far in the GC, we were forced to control the race. The guys did a fantastic job. Tomorrow is a very hard stage but I'l take them each day at a time and try to remain focused." White jersey and 3rd overall, Tom Dumoulin (Giant-Alpecin): "It took 70 km for the break to go. It was a very hard fight before that. The best placed riders were like 6 minutes behind in the GC and Astana were forced to chase behind 24 riders. Eventually nothing happened in the GC. Everyone was hoping for an easier day but it didn't happen. I feel pretty well. We had two days that were easier for the GC. I didn't have to go full gas in these days. I hope I have saved my legs for the three days ahead. Definitely Astana are not going to wait. It's very open still. Lots of guys are close to each other in time. It's' going to be an open race." Green jersey and 5th overall, Esteban Chaves (Orica-GreenEDGE): "It was a very fast stage with a break at km 70. I said to my Colombian friends it's like a race in Colombia. All day full gas and finally the break. Tomorrow we have three very important days in the mountains. The plan I think for us is to follow the big riders, save energy and maybe one day you have very good legs and you try. We now have 15 days in the legs and now the legs are not like they were in Malaga. I'm tired." KOM, Omar Fraile (Caja Rural-Seguros RGA): “The stage was a torture. We tried to go in the break, it was a crazy start. It took 70 km for the break to go. Then we stayed in the peloton to save strength for tomorrow. I rested. It seems that tomorrow can be a quiet day for me, because I'm not interested in the break. The key will be the two stages in the Asturias. My rivals will be Plaza and people who can go in the breaks. Its important to catch one some day and take as many points as I can." 10th overall, Romain Sicard (Europcar): "In the finale, I was lucky to rely on Yukiya Arashiro who made a fantastic job. Afterwards, and it was just as well, the teams who were looking for a sprint pulled too and it allowed us to gain a little bit more time. I don't have any regrets, the end of the stage did not suit me. Oliveira went and he showed he was the strongest. The goal was to go up in the GC (10th now) but I will need to recuperate ahead of the days to come. It's going to be hard for sure tomorrow but I will hang in there like I've done since the start." Kenny Elissonde (FDJ.fr): "With the wind, it was good to be 25. I don't know when Nelson went. It was chaotic. It was attacking from all sides. We worked well together during the stage but in the end everybody was tired. I don't know when he went. It was a solid attack. When he took 50 seconds, he's such a strong rider, it was finished. I go up in the GC, I don't know how much but to ride like this everyday I will end up having a bad day. I was afraid of the small roads and the headwind and I told myself I would be better off in the front than in the peloton. It was the right choice. I love to ride in the front. You take great pleasure riding like that." 10. Maxime Monfort (Bel) Lotto Soudal. 10. Romain Sicard (Fra) Europcar at 2:51. Alessandro de Marchi (BMC) beat fog and his four breakaway companions at the top of Alto Campoo to win his second Vuelta stage in two years on Saturday's Stage 14. The first of three grueling mountain stages in the north of Spain did not have a major impact on the race for the GC, even if Dutchman Tom Dumoulin squandered 19 seconds in the finalé while Nairo Quintana (Movistar) showed he was back in form after being hampered by a virus. 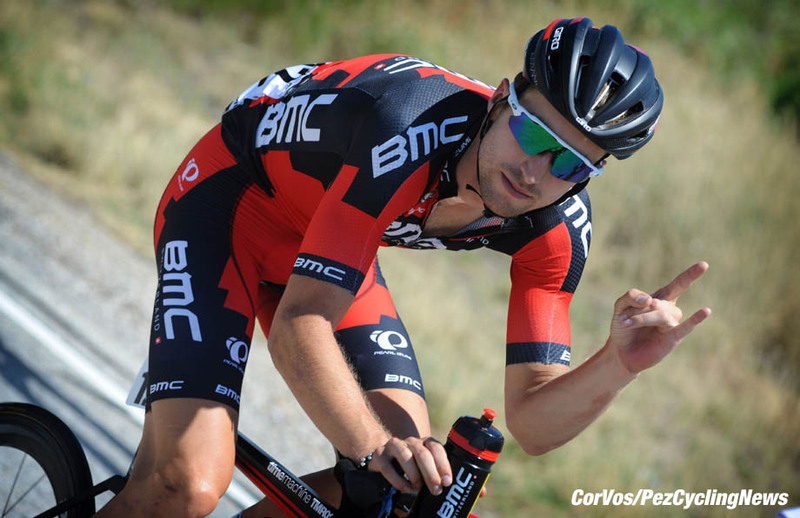 Samuel Sanchez (BMC), forced out by a foot infection as the race was nearing him home region of Oviedo. Breakaway attempts took place straightway with Alessandro de Marchi (BMC), the most active attacker with fellow-Italian Salvatore Puccio (Sky) and Spain's Joaquin Rojas (Movistar). The three of them were part of the day's break which went after 59 kilometers and also included France's Mikael Cherel (AG2R-La Mondiale) and Carlos Quintero (Colombia). At the top of the Cat 3 Estaca de Trueba (118km), the five, with Cherel in front, were leading the peloton by 8 minutes. At the bottom of the Puerto del Escudo (Cat 1), the gap reached 10 minutes. Cherel was again first at the top, which the Astana-led bunch reached nine minutes later. Quintero took the three seconds bonus at the sprint at the foot of the last climb. More than nine minutes ahead into the final ascent, the five were certain to battle it our for the stage win even if local hero Francisco Ventoso (Movistar) and Luis Leon Sanchez (Astana) helped reduce the gap. Astana then took charge of the chase with Aru safely on their heels. Four kilometers from the line, Cherel attacked but De Marchi brought the group back together. The Frenchman was at it again 1.5 km later and the Italian again pulled him back. 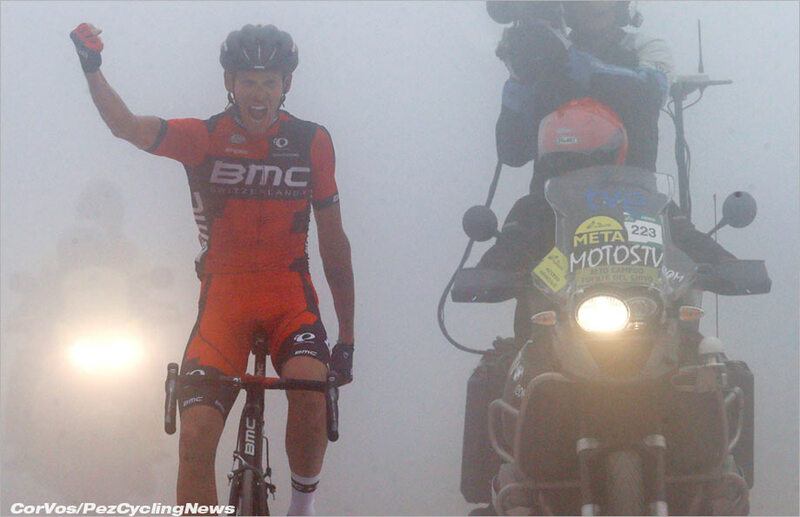 The stronger of the break, De Marchi again quashed attacks by Rojas and Puccio to go on his own and win in the fog. The battle for the overall lead also started three kilometers from the finish when red jersey holder Fabio Aru surged with Quintana on his heels. But the Italian had probably moved a little bit too early as he saw Joaquim Rodriguez (Katusha), Rafal Majka (Tinkoff-Saxo), Esteban Chaves (Orica-GreenEDGE) and Domenico Pozzovivo (AG2R-La Mondiale) pull him back. Rodriguez and Quintana then attacked in the final to collect a few seconds. Tom Dumoulin, who finished 26 seconds behind Quintana with Alejandro Valverde (Movistar) and Daniel Moreno (Katusha) were the only leading favorites in relative trouble in the finale. Stage winner, Alessandro De Marchi (BMC): "With a bit of luck, in the right moment, I had the energy to do a fast attack, I was lucky because I do not think I was the strongest. I never thought I would be able to win a stage, today was very difficult, first to get in the breakaway and then to take the win. But everything felt great. Everybody else was looking at me, so I had to do the big job to bring them back, then I had to keep waiting and waiting for the right time." 4th on the stage, Mikael Cherel (AG2R-La Mondiale): "I'm very disappointed because I did not seize my chance. It doesn't happen so often. I tried to attack twice but De Marchi was the strongest. He's an experienced rider who already won on the Tour or the Vuelta last year. He was difficult to handle. When I saw how strong he was, my morale took a blow. I told myself I could no longer win, that I was going to finish second or fourth. Who cares? I've attacked for the last couple of days. My sensations are not so good even if I rode at the front. I have to do with it. " 6th on the stage and 9th overall, Nairo Quintana (Movistar): "I felt very good. Yesterday and the last few days were really bad. But apparently the virus passed. I hope I can fight for the podium at least. There are still many stages to take time back. I should take advantage of them. If I still have the sensations I had today, I possibly can make up time. I have not entirely recovered. I still have a lot of abdominal pain, the stomach is not OK but today I proved that I have very good legs and good feelings." Green jersey, 8th on the stage and 4th overall, Esteban Chaves (Orica-GreenEDGE): "The last four kilometers, Astana were unbelievable, they reminded me of the Giro. I'm glad I could stay with the best riders. I'm very happy for Quintana. Yesterday he was suffering a lot and today he rode an amazing race. He really has big class. The team worked good today. It's important to try to keep this position for the GC in Madrid." Overall leader and 9th on the stage, Fabio Aru (Astana): "I attacked with three kilometers to go but then I saw that Quintana was with me and then Purito came back too. I was not surprised because they are great champions. The idea when I attacked was to make the race tougher because Tom Dumoulin is still there and he's excellent in time trials. We have two hard stages ahed of us and there will me more opportunities to attack him. I don't know how much time will be needed to beat him. The time trial comes in the third week of a grand Tour and it can make a difference. Every stage is important. There are fewer stages left and that's why we wanted to make a point". 7th overall, Alejandro Valverde (Movistar): "It was hard. The climb itself was not so hard but after so many kilometers at full speed and after two weeks of Vuelta there were not so many gaps. Aru attacked well but eventually Nairo managed to take a little bit of time off him. We still have two hard stages ahead of us. Personally I hope to be better than today. Nairo is recovering well for the two hard days ahead." White jersey and 3rd overall, Tom Dumoulin (Giant-Alpecin): "It was not as good as I was hoping for. I lost a little bit of time but not too much. The next two days are harder with shorter but steeper climbs. Normally I should lose a little bit more time. I didn't have my best day today but I managed to save my losses. It's always better to have a target in sight. It was difficult but I knew they were no too far away. 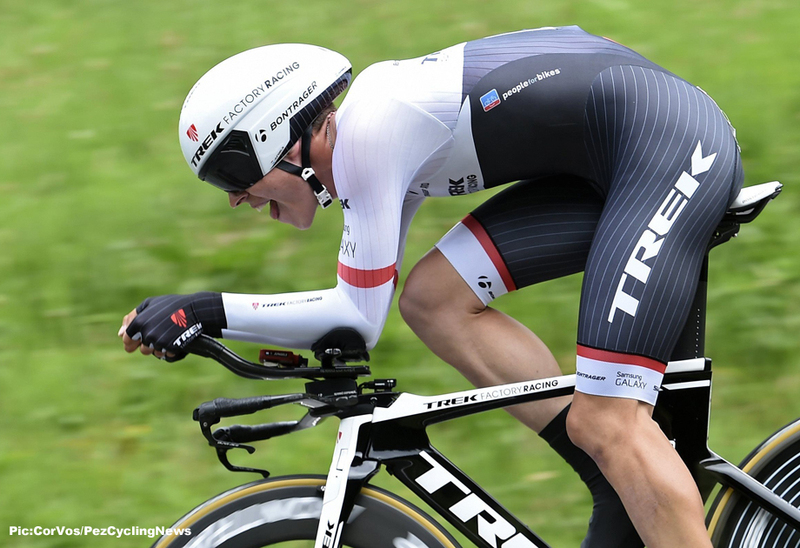 It's a compliment that they feel the need to take some time out of me before the time trial." Abandoned, Samuel Sanchez (BMC): "This is a hard day for me to have to abandon the Vuelta a España," Sánchez said. "The problem with my toenail made it impossible for me to pedal. Yesterday was a really, really hard day for me. I had a lot of pain in my right leg and today it was just impossible after 35 minutes of the race." 10. Rafal Majka (Pol) Tinkoff-Saxo at 3:44. 10. Romain Sicard (Fra) Europcar at 3:39. Joaquim Rodriguez narrowed the gap to Fabio Aru (Astana) to just one second at the Vuelta after his late attack earned the Spaniard an impressive victory on Stage 15. 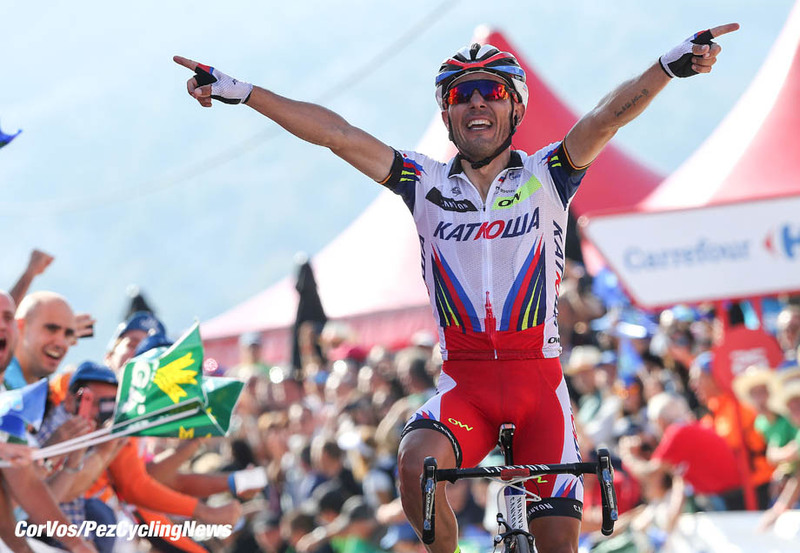 The Katusha rider made his move in the steepest part of the final climb, one km from the finish of the 175.8 km race between Comillas and Sotres, beating Rafal Majka (Tinkoff-Saxo) by 12 seconds and his team mate Dani Moreno by 14 seconds. 'Purito' collected a 10-second time bonus that helped him almost annihilate Aru’s advantage after the Italian Astana rider finished 5th, 15 seconds off the pace, just behind Nairo Quintana (Movistar). Tom Dumoulin was distanced in the finale but he paced himself to the top. The Giant-Alpecin rider slipped to 4th overall, 1:25 behind Aru and one second adrift of Majka. After 35km, the day’s breakaway finally took shape with Kadri (AG2r-La Mondiale), Viela (Caja Rural-Seguros RGA), Rollin (Cofidis), B. Ramirez (Colombia), Maes (Etixx - Quick-Step), Berhane (MTN-Qhubeka), Rolland (Europcar), Tjallingii (LottoNL-Jumbo) and Zubeldia (Trek) covering 49.4 km in the first hour. They enjoyed a three-minute gap over the Movistar-controlled peloton at the feeding zone in Prestin (94.5km). At the foot of the Alto del Torno (Cat 2), the fugitives had a four-minute lead. Rollin was the first at the top (115.1km) ahead of Rolland and Tjallingii as the nine-man group extended their advantage to five minutes 50km from the finish. Maes won the intermediate sprint in Posada (132km) ahead of Rollin and Vilela. The pack was strung out as three Movistar riders (Sutherland, Erviti and Ventoso) set the pace do reduce the breakaway’s lead. In the final climb to Sotres, where gradients reached 13% in the final section, Kadri was the first to attack but it was Zubeldia who had the best legs, going solo with just under 11 km left while the rest of the breakaway group was being picked up by a thinned-out peloton. Quintana attacked 10 km from the line but he was marked out by Luis Leon Sanchez as Astana took control of the pack with Dumoulin struggling at the back. Zubeldia still held 1:03 over the peloton with 7.5km left but Movistar upped the pace at the front again and the Spanish veteran’s lead had melted down to 43 seconds with 5 km left. Dumoulin was distanced with just over two kilometers left but the he stayed composed and finished 51 seconds off the pace. With 1.9 km remaining Zubeldia was caught and dropped. With 1km left in the punishing 13-km final ascent, Purito pushed harder on the pedals and took a solo win. Quintana, who was initially distanced by Aru and Majka, hung on for dear life after all and stayed three minutes behind Aru in the GC. Stage winner and 2nd overall, Joaquim Rodriguez (Katusha): "This is incredible. What a hard climb but what nice win too. The cheering fans helped me a lot as well as my teammates. This is a phenomenal Vuelta. The whole Vuelta we were looking for this stage win. Now we have it and we even play a role for the GC. For the moment the situation is perfect for me. I miss one second for the race lead but that is not so important. In the end the strongest rider will win the Vuelta. The good feelings that I have now are more important than that red leader’s jersey. Tomorrow we have again a hard stage with possibilities. I will try again but if it doesn’t work I will try another day. I don’t want to use a calculator to find out how much time I need to take before the time trial in Burgos. In the past I calculated too much and it ended badly. I just look ahead from day to day. We came to this race to arrive on the final podium. We are on the good way. Tonight we will shortly celebrate and tomorrow we will suffer again. In this Tour of Spain there are still nice things to come. The race is not over yet. One second behind Aru but 1.23 and 1.24 ahead of Majka and Dumoulin. Especially Dumoulin can still be dangerous. He lost time today but rode very clever and he will be hard to beat in the time trial. We’ll see. The last five years I finished four times in top 4 overall. Very strange but this Vuelta is the less stressful of all my Vueltas. It is hard to explain, but I hope to continue this way. Very tranquillo." 3rd on the stage and 6th overall, Dani Moreno (Katusha): "You always want to win and you try because we always go to every race to do our best. It was good, very good for him and for me also. He attacked at the key moment and was able to go forward. We will have to get some control on the race. We hope that tomorrow there will be a bit of rest." 5th on the stage and overall leader, Fabio Aru (Astana): "It is not a good day because I’ve lost 25 seconds to Purito who was outstanding today. But I gained time over Dumoulin but this doesn’t make it a good day. The difference is that Purito is more explosive than I am, that’s all. I gave everything but I could not avoid losing time. I am worried by all the riders, Rodriguez, Majka and Dumoulin are very strong. After what he has already shown in time trials, Dumoulin is a real contender for the overall victory but I don’t know how much time he can gain in the Burgos TT. I also know that tomorrow’s mountain stage before the rest day will be very tough." Last man to be caught from the break, Haimar Zubeldia (Trek): “We quickly realized that the peloton would not let us really go when they maintained the gap around three minutes. We tried to take it easy before accelerating in the second part of the stage. The gap rose up to five minutes but they reacted again. We had 1:30 at the start of the final climb but I knew the end would be very hard with those very steep parts. I did not start this Vuelta in the best conditions after being treated with antibiotics between Tour and Vuelta. I will try my luck again." Most aggressive rider, Brayan Ramirez (Colombia): “I was not feeling well at the beginning of the stage. I fought to be in the breakaway and to get that prize for the most aggressive rider of the day. Once you’re in front it’s different. I think I would have suffered more if I had been behind in the peloton. My team trusted me to get to the front even if I was still a little bit sick. We’re going to go on like this until the end of the Vuelta." 10th overall, Louis Meintjes (MTN-Qhubeka): "It was another nervy day with quite a lot of wind. Movistar controlled the race for most of the day, it looked their guys were confident about going for the stage win. For us, we had Natnael up the road and so the rest of the guys supported me really well all day up to the climb. From there I just it gave it my best. I am happy with how things worked out." 10. Domenico Pozzovivo (Ita) AG2R-La Mondiale at 0:41. 10. Louis Meintjes (RSA) MTN-Qhubeka at 5:07. The 200.8km Belgian race with 13 hills, was only decided by the photo-finish as Dylan Groenewegen (Roompot) took the win by a tyres width from Roy Jans (Wanty-Groupe Gobert) and Tom Boonen (Etixx - Quick-Step) in 3rd. A five riders made up the breakaway of the day: Malaguti, Fominykh, Wallays, Van Melsen and Delfosse, escaped after 40km for a maximum lead of 3 minutes on the peloton. When the sprinters' teams decided to lead the bunch, the advantage for the breakaway decreased and the gap was closed 32 kilometers from the finish. As the race entered Brussels, with 15km to go, the bunch broke in three parts and Etixx - Quick-Step started the lead-out for Boonen. The ex-World and Belgian champion had trouble with his gears on the run, but still managed 3rd. Roy Jans thought he had the win, but with a last minute push Groenewegen edged the Belgian into second spot. 2nd, Roy Jans (Wanty-Groupe Gobert): "It was really, really close. At 50 meters from the line I thought I had won. It's frustrating to be beaten by mere centimeters after the difficult season it has already been so far,"
3rd, Tom Boonen (Etixx - Quick-Step): "We did everything well today, my teammates supported me, and we went into the final with basically all of our guys pulling in anticipation of the sprint. But in the final kilometers I had some shifting problems. I was on the wheel of Fabio Sabatini, but then suddenly the speed went down a little bit and was forced to shift. When I shifted again to relaunch I couldn't really do it due to the mechanical problems. It is a shame, but there is nothing you can do when materials of the road and the rain create complications like that. But OK, the race is over. I was still 3rd. The condition is there. Tomorrow there is GP de Fourmies. We will see if we can do something good there." 10. Giacomo Nizzolo (Ita) Trek. Four escapees were insisting on making it to the finish line after breaking clear in the first meters of Stage 1 of the Tour of Britain. But Conor Dunne (An Post-Chain Reactions), Tom Stewart (Madison Genesis), Kristian House (JLT-Condor) and Pete Williams (One Pro Cycling) were up against a long list of motivated teams in the chasing peloton. With Etixx - Quick-Step and Lotto Soudal on the front keeping the breakaway on a short leash, the bunch sprint decision was inevitable. Entering the final 1500 meters, the last standing escapee was neutralized and Team Sky moved to the front as well to set up things for their sprinter, Elia Viviani and he bettered André Greipel (Lotto Soudal) and Mark Cavendish (Etixx - Quick-Step) in the furious gallop. Stage winner and overall leader, Elia Viviani (Sky): "It was a technical finish and really close at the line. We worked hard all day, and Andy Fenn was fantastic taking such a huge turn on the front. Etixx – Quick-Step gave us a little bit of help, but Andy was unbelievable. With only six riders per team, it's difficult to control the race , and we only caught the breakaway in the last 2km. Ben [Swift], Pete [Kennaugh] and Ian [Stannard] then did more fantastic work in the final to put me in the perfect position. When I saw Greipel coming onto Cavendish's wheel on the last corner, I thought 'just stay here', but then I thought he'd left it too late to sprint, so when I saw Cav go down the middle, I stuck to the left-hand side of the road all the way to the end. After we'd crossed the line I wasn't sure if I'd won, but thankfully it soon became clear. It's going to be difficult to defend the jersey with six riders, because not only do we have to control the breakaway, we have to put me in a good position for the sprints. Today Swifty called the shots perfectly, telling us how to ride and when to close the gap. There is pressure on us to perform here, but for a sprinter like me, that's good. I saw how much effort my team-mates had put in so I knew I had to try my best. Sometimes that doesn't work out, but today it did and I'm very happy. My condition is really good at the moment, I was disappointed not to do better in my last races at the Vattenfall Cyclassics and GP Ouest France-Plouay – they were big goals for me – but I timed it correctly today. Sprints are won with split-second decisions and I'm happy I made the right choice out there. I have one eye on the World Championships, so this is a big confidence boost for that. There are a few short cobbled climbs to get over in that race, but I think I can do well. I won't be one of the favorites there, but I'm working hard in preparation for it and I've shown here that my legs are good." 2nd, Mark Cavendish (Etixx - Quick-Step): "I was kind of nervous about this final," Cavendish said. "Some of the guys did recon of it yesterday and they said it's really technical. We didn't know what to expect. So, we wanted to be in front at the end. The guys did super well. We put Fernando Gaviria ahead of Mark Renshaw, telling him what to do, and he was super good. After the last sharp left-hander, it was a bit technical with the wind blowing down through the buildings in the last straight. I knew I just had to lay off Mark, it was going to go uphill. When I kicked off Mark I kicked really well, but the line just wasn't coming quick enough. I could sense Greipel there and I think I just focused too much on Greipel. If I had taken the left-hand sharp, maybe I would have had it. But I was too concentrated on the right side, and Elia came through on the left ahead of me. But actually, I'm very happy with the team. They supported me wonderfully today. Congratulations to Elia as he deserved the win. We'll see what we can do tomorrow as we're already riding really well together." 8th, Tyler Farrar (MTN-Qhubeka): The finale was pretty hectic. It wasn’t easy to stay in front, given the narrow roads and technical race route. We were positioned well until about three kilometers to go, but then lost each other. I tried to find my way to the front after that but was just not in a good position to be up there in the end. Tomorrow’s another day." 10. Graham Biggs (GB) JLT Condor. Trek Factory Racing’s Fabio Felline won an exhilarating finish in the Grand Prix de Fourmies-La Voix du Nord Sunday, holding off the peloton in the final meters to take a nail-biting victory. Felline joined a late escape group that formed around 25 kilometers from the end of the 205-kilometer race and gained 30 seconds lead. But behind a disorganized peloton never closed the gap and allowed the group enough room to battle out the finale. Felline’s last move came with 1.5 kilometers to go, and at the same moment a crash occurred in the breakaway group as Filippo Pozzato (Lampre-Merida) tumbled to the tarmac, causing a little more chaos in the frenzied finish. Unimpeded, Felline put his head down and aimed for the finish line – with the fast charging peloton only seconds behind there was no time for more cat n’ mouse games; it was a do-or-die move. If Felline was caught, Trek Factory Racing still had an ace up its sleeve with Giacomo Nizzolo ready to contest the sprint. But there was no need: Felline powered around the final curves and in the last meters he knew he had the sweet victory in one of the hardest – and most exciting – ways to win a race. Thanks to the Trek team for the race info. 2nd, Tom Boonen (Etixx - Quick-Step): "Today we took the start with the objective to do well and try to win this race, after the bad luck we had yesterday at Brussels Cycling Classic. We rode a good race, but in the final at about 3 kilometers to go, while we were chasing and taking back the breakaway, there was a crash that involved Pozzato in the leader's group. This caused a deceleration in the peloton. We lost few seconds because of the chaos and Alaphilippe, who was contributing to the chase by trying to come to the front, was a bit boxed because of it. But we continued to chase. At 250, maybe 300 meters to go, I launched my sprint. It was the only way to try to catch Felline. I was almost 40 meters behind him when I launched, and I arrived at 1 meter behind him. It's a pity because I wanted to win. But, if I have to consider the circumstances, I'm happy about my race and how I sprinted in the final. My condition is good. On Tuesday I will fly to Canada. Quebec and Montreal are nice races. We will see what we can do there to try and grab good results as a collective. We have a nice team there with multiple solutions. We will see." 10. Marc Sarreau (Fra) FDJ.fr. Come October 24, just after the presentation of the route of the 2016 Tour de France, the stars of the iconic July race will get the chance to wrap up their season at the 2015 Tour de France Saitama Criterium, which will have a time trial on the menu this year round. It has become customary for the world cycling elite to travel to Japan for a relaxed but spectacular exhibition in the streets of Saitama. The third edition of the Tour de France Saitama Criterium has tweaked its usual program and thrown an individual time trial with one rider from each of the seven participating teams into the mix. The flexible format of this extra race enables organizers to invite seven women and seven para-cyclists to this huge celebration of cycling. However, the other ingredients in the recipe that made the first two editions a success will still be there: a thrilling 3.1 km course that will go through the Super Arena clockwise this time round, a program combining cultural discoveries and intense sports, and a field pitting the top Japanese riders on the national circuit and the champions who have stamped their marks on recent editions of the Tour de France. The big names on the start list will be revealed at a press conference to be held in Japan on September 24. Etixx - Quick-Step reached an agreement with rider Bob Jungels on a two-year contract (2016 & 2017). Jungels had a strong 2015 season, as he is the current Luxembourg National Time Trial and Road Champion, he was 6th overall at Tour de Suisse, 27th overall at Le Tour de France, and he also finished twice in the top five of Le Tour de France stages. He also won the overall of Etoile de Bessèges at the beginning of the year. "I am happy to ride for this team starting next season," Jungels said. 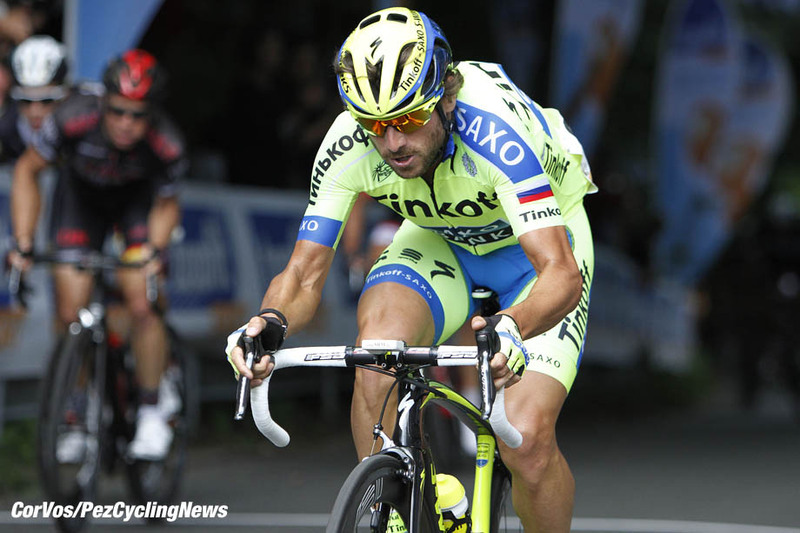 "I had a good talk with Patrick Lefevere after Le Tour de France, and we came to an agreement. It's a great team, and in the bunch you can really see them riding as a unit. The image of this team is really good in the peloton. The plan Patrick proposed for me was one I agreed with. I will focus on the shorter stage races and on the Ardennes Classics in my first year with the team. We will then approach the grand tours step-by-step to see what I can do for those in the future. For me, it's nice to be a part of a group where there are a lot of young riders, like Carlos Verona, who I know very well. I also know Julian Alaphilippe, who is the same age as I am. It will be a good mix of young riders and experienced guys on Etixx - Quick-Step next season. I have to say also that I like the style of this team. They are always aggressive in races, which fits my style of riding." "We are satisfied with this agreement," Lefevere, CEO of Etixx - Quick-Step, said. "Bob is one of the riders who stands out as one of the talents in cycling right now. He is also the first rider in the history of our team from Luxembourg, which is a nation that is growing up in the cycling world. Bob knows what he wants and we think we can achieve good results together, and move him to the next step of his career. He impressed us in the past, but especially this year with his attacks in Le Tour de France, and his 6th place in the Tour de Suisse. His racing this year really stood out for us. We thought this guy could be an important piece of our team in the future. We're really looking forward to collaborating together, and having a great 2016 season." Key values for telephone squad remain loyal to Unzué's roster after remarkable performances throughout the 2015 season. The Movistar Team announces on Friday that four members of its current roster have signed new contracts with the squad: Andrey Amador (CRC), Adriano Malori (ITA), José and Jesús Herrada (ESP). Amador and Malori both had a breakthrough season in 2015. The Costa Rican claimed an excellent 4th place in the Giro d'Italia overall, a feat that has turned him into one of the country's biggest sportspeople ever. In turn, the Italian has shone again with five time trial victories-including the Tirreno-Adriatico prologue, after which he wore the leader's jersey for two days, and the National TT title- and outstanding teamwork, also delivered by Andrey wherever he raced. Adriano is already fine-tuning his form before the World TT Championships in Richmond, USA, where he will certainly be a podium contender. The Herrada brothers have become an undeniable reference for the squad. José debuted in the Tour de France with big success this season, showing consistence and regularity into the mountains, while Jesús was as strong as ever, with good performances in Asturias-stage + GC podium-, the Giro, the European Games in Bakú, the Vuelta a Burgos or the Tour du Limousin, where he took a stage win and contested the overall success until the very last sprint. Fabian Cancellara has decided to end his 2015 season after a virus forced him to drop out of the Tour of Spain with stomach problems. Cancellara was poised to make his third come-back in one season, after breaking two vertebrae in E3 Prijs Harelbeke and once more during the Tour de France, wearing the yellow jersey. Cancellara: “Physically I could probably go on and race the World Championships. But it’s the mind that controls the body, and I don’t have the will to go through the whole come-back thing once more after the rollercoaster that this season has been. It's a matter of focus. Dealing with a serious injury during the course of one season is not easy, and I have had to do it twice already this year. It’s mentally very challenging and it drains your energy. 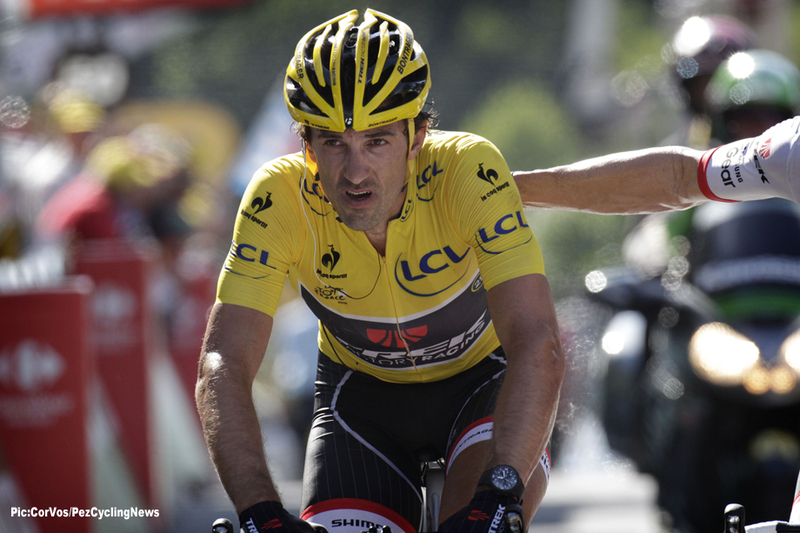 I don't have batteries anymore for a third come-back in one season," says a vintage Cancellara. “Since I returned home from the Vuelta I have been questioning myself a lot. It's more than just a lack of motivation. It goes deeper than that. It feels impossible to load the batteries enough to break through that wall in your head." "I’m sad not to be racing the Worlds, of course. The TTT is an important race for our team and everybody knows how much I love racing for Switzerland. I'm sorry for the TFR boys. They did a great job yesterday in Alberta and it's always a great experience to do a TTT at this level. I also feel sad for the Swiss team. Each year is always a lot of fun to be a team for one occasion, I love that. The Worlds next year don't suit me very well, I'm not a sprinter. This could have been my last chance, but then again, the way this season is going for me, not really." “I want to thank Luca (Guercilena), Trek’s senior management in the US, the team at Swiss Cycling and also my family for all the support. As an athlete you can feel very much alone when bad luck strikes, but I am very happy to have all these people supporting me year round." USA Cycling announced Friday the first 29 members of the 2015 UCI Road World Championships roster, naming 16 men and 13 women who make up the elite, U23 and juniors road race and time trial teams. USA Cycling will name the remaining elite men’s road race and time trial spots prior to the UCI mandated deadline of Sept. 11. The 2015 UCI Road World Championships will run Sept. 20-27 in Richmond, Va. This is the first UCI Road World Championships held on American soil since the 1986 edition in Colorado Springs, Colo.
Sixteen of the allotted 37 road race and time trial spots are automatic bids, while Carmen Small (Durango, Colo./Bigla Pro Cycling Team) earned a women’s individual time trial bid by winning the Continental Championship in May. For full schedule of events, course information and more, visit Richmond2015.com. Tune in to all the action on Universal Sports Network, universalsports.com and the official Richmond 2015 app.